It took some time for Arsenal to get going under new manager Unai Emery, but results have improved after a nightmare pair of opening fixtures against Manchester City and Chelsea. 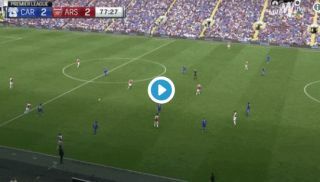 Arsenal have since looked better in wins over West Ham and Cardiff City, with this video clip below showing just how slick their football is becoming under Emery. The Spanish tactician is a known perfectionist who has been seen being very vocal and involved in training as he bids to micro-manage the way his players play.